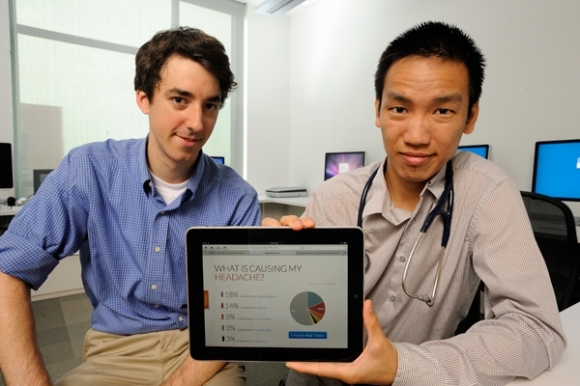 Two fourth-year Johns Hopkins School of Medicine students, Craig Monsen and David Do, have recently created a website that is smartphone compatible and helps determine disease pathology based on symptoms that you input into the system. Called Symcat, (symptoms-based, computer-assisted triage) the app allows the user to enter in various ailments such as a fever, cough, swelling etc. and receive an instant diagnosis. The app is currently available through their website, or can be accessed via an Android beta app. A version for the iPhone and other Apple products is said to be in the works. Using sophisticated algorithms, Symcat ranks the most likely medical conditions and gives suggestions for treatment based on aggregate patient data and triage guidelines from the Agency for Healthcare Research and Quality.Monsen and Do originally set out to create a user-friendly tool that would help medical students learn how to prioritize diagnoses and determine the prevalence of various conditions, since many diseases and ailments share common symptoms. The two met as first year medical students and bonded over their common backgrounds. Monsen has a background in bio-medical engineering and computer science and Do also has an educational background in bio-medical engineering. Before working on Symcat, the duo collaborated on a software app that pulled data from electronic medical records for research purposes, as well as a web-based fitness tracking system and a student web portal now used widely in the John Hopkins School of Medicine. The video below gives the basics of how Symcat works. Additionally, below is Craig Monsen excitedly discussing their recent success in the Robert Wood Johnson Foundation Aligning Forces Challenge. There, Symcat was the grand prize winner, receiving a $100,000 check. The competition, created last fall, asked amateur and professional technology developers from across the United States to create easy-to-use online and mobile device–based tools that would give consumers greater access to health information. The money will allow them to refine Symcat even further. Do explains that winning the Robert Wood Johnson Foundation competition has further inspired them. In the future, Monsen and Do believe that Symcat will continue to improve through the addition of more data and its user community’s ability to provide relevant feedback on the app’s diagnosis accuracy. It will also incorporate user reviews of medical providers and care cost information. Ultimately, it appears that Monsen and Do want to create a community where patients can help others. This is totally useless. I tried it out, plugging in a very textbook constellation of 1)pleuritic chest pain, 2)hemoptysis, 3)shortness of breath, 4)unilateral leg swelling ….and NOWHERE is there a mention of PE. It gave me completely inaccurate diagnoses of pneumothorax, ARDS, and other garbage. This project in its current state is inaccurate, and dangerous if used by the general public. it’s by no means a final product. and isn’t meant to be used by the public. it says that clearly on the site. it’s a work in progress. usually before a final product launches it needs beta launches and trial runs to find issues like you mentioned above. Thanks for your feedback! Try it again. You’ll find results closer to what you’re expecting (ie PE at the top). The problem was that the symptom “Pleuritic chest pain” was using an older system. As more of an explanation, if you’re interested, every now and then we have to make some tweaks to the medical ontology to capture new symptoms or diagnoses. We have a process for refining this based on what symptoms are most commonly entered. As Iltifat mentioned, we’re a proponent of the “release early and often” school whereby the site is by no means final. Your feedback really helps us out though, so keep it coming! Not sure how you got those results. This even though the Android app only offer substernal chest pain or chest tightness for chest something and this throws the diagnostic algorithm off on the wrong trail for a moment. So in my view this is a very good tool. I love the percentage thing. Sure the Android app in its current form is almost unusable due to its slowness but it’s in beta so no complaints here. I’ve installed it on Nexus 7 tablet with latest Android OS on (Jelly bean). It’s actually baffling why it is so slow. In the meantime, I’m happy playing with the web app. It would be nice if the Android app displayed info about the conditions like the web one does but I suspect this is in development. @Physician, actually it does show PE as a possibility when the symptoms you mention are typed in if you answer all the questions, including no to all past medical history questions. However, it shows up low on the list at 1% (when age over 65 is chosen), whereas DVT (the likely cause of the PE in your example) always comes at the top of the list. It then recommends immediate care by contacting 911. So not sure why you would consider this dangerous for use by the general public, especially given all the misinformation that is out there. It may be a work in progress but ultimately a data driven approach is going to win. I think the variation seen even in these comments is testament to the infancy of this tool. As you probably know, even in a low risk patient with pleuritic chest pain (PERC negative) the incidence of PE is as high as 2%. I am totally behind data driven approach, but one must be aware of “poor” or biased data. This is why the creators should consider using data from RCTs and other well controlled studies – not simple aggregate databases that are well known to be fraught with biases and other methodological problems. If this tool is meant for clinicians, it must use high quality data (and sources cited!). However, publications on sites like this one only means patients will begin using it. Keep the good work, and move us towards high quality evidence based medicine? I completely agree with you about the necessity to find unbiased, quality data. I wish it were a straightforward matter to find RCT data for this kind of thing, but I’m not sure what that would mean for prevalence data. Multicenter studies would be immensely helpful here, but the fundamental problem is that it is hard to query existing EMR datasets for arbitrary symptoms. I believe the CDC data is the best we have for this type of analysis though I would appreciate it if you had alternative suggestions. We’re still working on exactly how to make this work, but our hope is that we can collect data from users and further train the algorithms. How does this really differ from the tools WebMD or iTriage are providing? They’re all using the same or similar data sets to get to the same conclusions. I don’t see how unique this is (at least at this point). Their vision is great. So, there are probably about half a dozen or so medical content providers that get recycled among all of the popular sites. The ones I find most frequently are Healthwise and ADAM. iTriage is somewhat novel in that they supposedly produce their own content, though I have found that at least a fair portion is licensed content as well. The sites/apps that take this approach are without a doubt media companies. They serve ads or generate referrals. In many cases, they keep you clicking because that’s what pays the bills. We believe that health content on the web is basically commodified and the ad-based revenue model, broken. If you need proof of this compare what you find on WebMD with the equivalent page on Wikipedia. There is not much value in creating new encyclopedic content. Our approach is to transform as much data as we can get our hands on into actionable insights. This is hard because dealing with data is never as easy as just plugging in a database. Even data we generate internally is messy, which is why the WebMDs of the world are shying away from it. We’re trying to take the approach that the great data product companies of our time (eg Google, LinkedIn) would take if their companies depended on solving this problem. It may be a fool’s errand, but we think it’s really exciting and we know that our vision will one day exist whether we’re the ones creating it or not. As far as I know WebMD or iTriage don’t offer diagnostic algorithms (or am I missing something?). They offer info on conditions. And for that FirstConsult or Medscape are far better/more reliable. BestPractice does start from symptoms but once you select a symptom it takes you to a list of most likely diseases that have that symptom / where symptom matters. You can’t add a second symptom and narrow it down and then a third and so on. Sure, you might be able to narrow it down after reading the article on shortness of breath, but it’s not as easy as adding a second symptom and then a third. Dxsaurus also starts from symptoms and then gives you a list of possible DxDif. And I suppose that if you took 4 pieces of paper (chest pain, hemoptysis, shortness of breath, leg swelling), write on each the differentials that Dxsaurus gives for each and then cross check them you might get to PE in the end. I would also doubt that similar data sets are used or that the conclusions are the same. Even here in the UK where you have national protocols of care across the whole system in many conditions and you still couldn’t say that (same input, same output). There aren’t many computerised diagnostic algorithmics tools out there because it’s actually very difficult to make them. People have been working on this for at least the past 15 years. Medical error would go down dramatically, providers might hire 3 physicians instead of 4, telehealth would move a step closer to reality, junior doctors would be happier & safer, etc. So yeah, I think this is pretty unique. It mimics what happens in clinical setings where patients come with a set of (signs and) symptoms that get told to you , the physician, one after the other. During this process your physician’s mind does what this algorithm does, keeps pushing the PE at the top pf the list. Then you order the PE investigations or proceed to treatment (as the situation may be) based on this 18-24% chance. I hope this tool stays firmly directed at physicians but also remains open to patients as well. The Patient.co.uk site mentioned above does this, it has for almost each topic, a patient version and a physician version and both can be accessed by everybody. The great thing is that the physician version is textbook accurate and the patient version is not simplistic and dumbed down at all. Patients say that it reduces their anxiety and it builds their trust in the providers (they are more engaged). But then it’s a different health system here in the UK, so don’t know if this is the case in the US. There is an app called iTriage Health. Is your app similar or something new?